CRAZY COOL GROOVY!!! 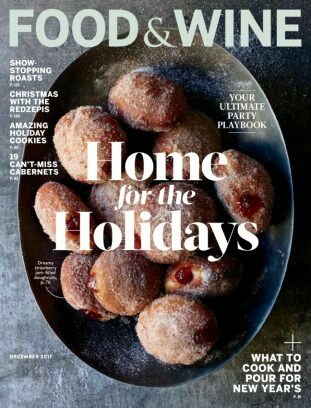 : I LOVE 2 EAT #178 - FOOD & WINE MAG: HOME For The HOLIDAYS!!! I LOVE 2 EAT #178 - FOOD & WINE MAG: HOME For The HOLIDAYS!!! HAPPY HOLIDAY SEASON 2017 to ALL of My CRAZY COOL GROOVY Family, Friends, Frats, Fans, Followers, Frenemies, and; FANTABULICIOUSTICAL Funky Fresh Fly folks of ALL Colors, Shapes, Sizes, Flavors, Persuasions, and; Denominations!!! The good folks at FOOD & WINE Magazine want to help YOU to get your upcoming DECEMBER HOLIDAY GATHERING started EARLY with either CHRISTMAS MORNING BISCOTTI, or, CHOCOLATE PEPPERMINT MARSHMALLOW COOKIES, or; BOTH. When either is paired with fresh hot coffee or tea, everyone present should be primed for the the later delicacies. Commence the main meal of the day with either ARUGULA-And-SQUASH SALAD, AVOCADO-And-RADISH SALAD, or, BOTH; which should prepare your palate for AVAOCADO HALVES With FLAXSEED FURIKAKE, HERBED SALMON TARTARE With CHIPS, or, BOTH. Need some soup??? Make your meal even more festive with some soothing-warm MILLION DOLLAR STEW. Get oh so fancy with your GOOSE STUFFED With APPLES And ARMAGNAC-Soaked PRUNES, STANDING PORK RIB ROAST With CRACKLINGS, or; ROAST LEG Of LAMB. Complement your main meat dish with EASY CREA4MED SPINACH , CARAMEL POTATOES, HEARTY MEXICAN CRANBERRY BEANS, or; PARSNIP MASH With FRIED BRUSSELS SPROUT LEAVES. The sweet should be in the mood for sweets, so; indulge them with ALMOND RICE PUDDING With SWEET CHERRY SAUCE And CARAMEL CREAM, MOODY TONGUE'S CHOCOLATE CAKE, TRES LECHE CAKE, or; MATCHA TEA MARSHMALLOW CRISPY TREATS. Should you or anyone of your guests find yourselves having after-hours cravings, try HOMEMADE APPLESAUCE With CHINESE FIVE-SPICE, SPICED ITALIAN PECAN MERINGUES, or; KEY LIME MACARONS. MERRY HAPPY HOLIDAY SEASON 2017!! !